Every morning on our walk to school, my children are on the lookout for new pumpkins appearing at the front doors of our neighbors. “Look, there is a white one. I’m going to call it ghost pumpkin,” says my 4-year old. “And there is an orange one peaking out,” shouts my enthusiastic 7-year old. Did you know that when you’re 7 even the most mundane thing can be extra-ordinarily exciting? You see, I love looking at Halloween decorations but have never had a big urge to put them up at our house. Maybe it’s because we are so busy with putting the garden to rest for the winter, raking leaves, making costumes and of course, baking…LOTS of baking. One story my children never seem to grow tired off is a cut-and-tell story about a witch, a ghost and a pumpkin. The story is in the October issue of Sophie & Max and I’m making it available as a FREE download for everyone! PLUS our go-to play dough recipe with some play ideas. I use this poem a lot in my classes and the children always love it, especially when you add some simple motions (check out this video to get some ideas). Third one says But we don't care! Fifth one says Its time for Halloween fun!!! Ooooooooo went the wind And OUT! (Clap) went the light. 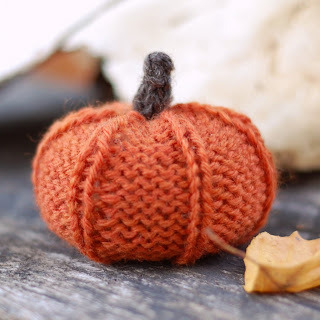 I found this pumpkin knitting pattern last year and made one little pumpkin for my children to play with. I only had one kind of orange yarn that wasn’t the best choice but of course my children didn’t mind one bit. I’m planning on knitting one or two more this year with bulkier yarn. And maybe by next year my daughter can knit her own. She is a very good finger-knitter and we are starting the journey of learning how to knit with needles. 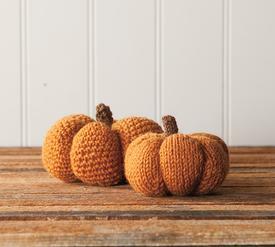 Here is another free knitted pumpkin pattern that I haven’t tried yet, but I might just have to make this one as well this year. And for those of you that don’t knit, here is a no-sew fabric pumpkin. It says to use a 22-inch bandana but you can use any kind of square fabric. I like to use old shirts or fabric scraps for those kinds of project. And for the filling, use your favorite batting, beans, cherry pits or similar. We loved the Orange House story! My 7 year old really enjoyed it. Thank you, as always, for these ideas!